It was back in November of 2003 when 21-year-old Aaron Voros was informed by doctors that amputating his leg would offer the best chance at surviving the cancer that had been festering beneath his kneecap. Yep, Voros is a hockey player and prior to discovering that half-a-baseball-sized vascular tumor inconspicuously tucked under his kneecap and attached to his femur, he had a lot to be thankful for. Today, following four different hospital visits, seven operations and eight agonizing weeks of flushing tubes that flowed from his chest to his heart, he’s just thankful to be alive. Voros is also enjoying his lifelong dream of playing in the NHL this season -- as incredible as that may sound -- for the Minnesota Wild. This, despite the fact a quarter-inch section of the lower femur in his left leg is now missing, the result of his body rejecting the cadaver bone that was originally stuffed into the open wound that caused a staph infection. His is a story of survival and courage and one that will certainly pull at the heartstrings of anyone willing to listen. Voros, now 26, has been nominated for this season’s Masterton Trophy as that NHL player who best exemplifies the qualities of perseverance and dedication to hockey. Voros starred in the British Columbia Hockey League with the Victoria Salsa, helping the team to the 2001 Fred Page Cup title. After being drafted by the New Jersey Devils in the 10th round of the 2001 Entry Draft, he attended the University of Alaska-Fairbanks and was named to the CCHA All-Rookie Team in 2002. It was the following season in 2002-03 when Voros’ world took a dramatic turn for the worse. The most frightening part of Voros’ three-month ordeal may have been when doctors discovered the staph infection following his fourth surgery. Not until he finally met a tumor specialist at the University of Washington and had subsequent surgery on Jan. 30, 2003, was Voros’ nightmare finally reaching an end. With the assistance of Alaska-Fairbanks strength and conditioning coach Mike Curtin, Voros’ rehabilitation program took shape in the summer of 2003. He added 42 pounds and prepared himself for a miraculous return to the ice. He would play in 36 games for Alaska in 2003-04, scoring 16 goals, 24 points and 132 penalty minutes before joining the American Hockey League’s Albany River Rats. 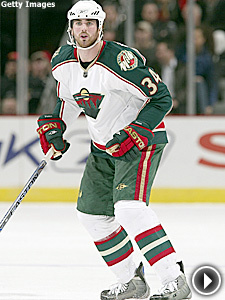 He was traded to Minnesota from New Jersey on March 1, 2007, in exchange for a 2008 seventh-round draft choice. “I feel in better shape now than ever before and I’m really motivated,’’ said Voros (14 points), whose 90 hits rank third-highest for the Wild this season. Earning nomination for the Masterton has taken on a different meaning for Voros. So to do those NHL fans, coaches and players to have Voros back on the ice.